Historic fishing stages line the shore at Battle Harbour at the entrance to St. Lewis Inlet in Southern Labrador, Canada. The historic fishing village of Battle Harbour is located at the entrance to the St. Lewis Inlet in Southern Labrador and as you tour the island, old fishing stages line the waterfront. Some of the fishing stages are barely standing as Battle Harbour only became inhabited in the 1770's. Old fishing boats remain upside down outside the fishing stages which were used by the local fisherman in the early years. 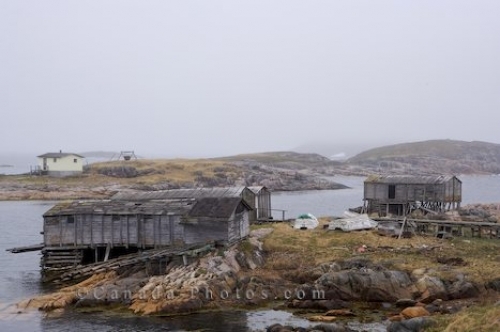 Picture of the old fishing stages along the coastline of Battle Harbour in Southern Labrador, Canada.